With the increased use of smartphones and portable devices within the past decade, the traditional setup of a workplace has become obsolete. There is no longer a need for landline phones, and desktop computers are inefficient when it comes to retrieving information on the go. Many companies have implemented Bring Your Own Device (BYOD) programs. While allowing employees to bring their own devices improves productivity in the workplace, companies risk security problems by vastly expanding their networks. 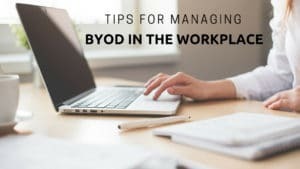 By implementing a plan for a BYOD program, businesses can predict potential troubleshooting problems and errors within the network by creating a policy to follow. According to Security Solutions, only 20.1 percent of companies surveyed had signed a policy governing BYOD behavior. By taking the time to create a plan that will meet the IT needs of employees and ensure safety, companies can decrease their network vulnerability. In addition to creating a plan, businesses should invest in educating their employees on how to properly access information on their devices. Employees should be able to recognize and avoid spam links that are often found in emails. In addition, employees should have a significant understanding of which devices are secured under the network. For example, devices that are jailbroken should not be allowed in the workplace because they often carry viruses and malware. According to Tech Talk, employees should also have a thorough understanding of the importance of keeping personal data separate from work information in order to prevent conflict. IT service providers can be a valuable resource when it comes to managing a network fit for BYOD programs. These providers can offer advice for keeping the network running and safe for users. IT service providers can also implement network monitoring that offers 24/7 support for the network. The benefit of this service is that businesses can access tech support at any time of day and troubleshooting problems with the network can be resolved as soon as possible. Overall, IT professionals can offer helpful insight to ensure your business is optimizing its network with a BYOD program. If you are interested in a 24/7 network monitoring service, visit MDL Technology’s services page to learn more!